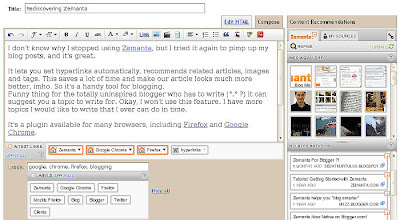 I don't know why I stopped using Zemanta, but I tried it again to pimp up my blog posts, and it's great. 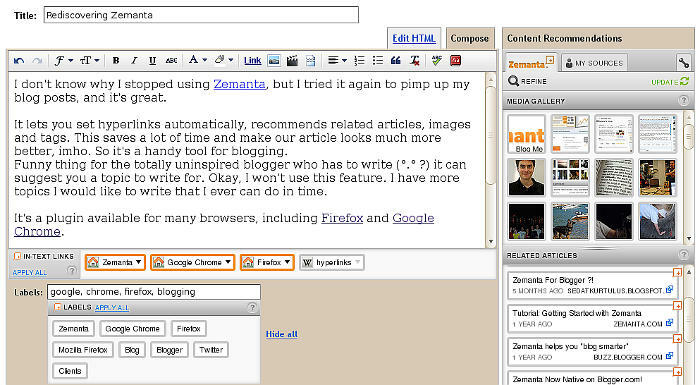 It lets you set hyperlinks automatically, recommends related articles, images and tags. This saves a lot of time and make our article looks much more better, imho. So it's a handy tool for blogging. Funny thing for the totally uninspired blogger who has to write (°.° ?) it can suggest you a topic to write for. Okay, I won't use this feature. I have more topics I would like to write that I ever can do in time. It's a plugin available for many browsers, including Firefox and Google Chrome.